The Kunsthal does not have a collection of its own. It owes its existence to collaborations: internationally, nationally, regionally and locally with a variety of institutions, museums, artists, specialists, foundations and businesses. In addition, the Kunsthal places even more emphasis on an annually recurring collaboration connected with a large-scale exhibition whose theme addresses a broad (and new) public, is ideally suited for optimal visibility, and offers points of contact with the city. 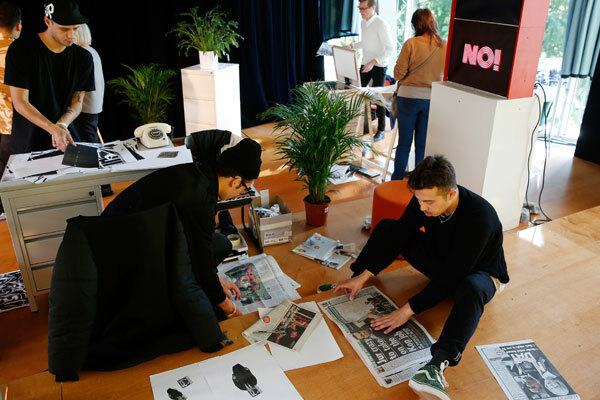 To reach more and new target groups, the Kunsthal organises extra activities in the Auditorium, ranging from weekends linked to exhibitions to concerts and film screenings. This programming is done with parties in the city and elsewhere, with young talent and established names, and includes cross-overs between different disciplines. The Kunsthal Freaky Spring was launched during Rotterdam Museum Night. The lively programme, including the absurd moving installations of the Czech artist Krištof Kintera and the ironical and playful designs of the Dutch artist Piet Parra, brought more than 4,000 visitors to the Kunsthal and the Museumpark on the first evening. During the Freaky Weekend on 18 and 19 April, at the start of the National Museum Week, there were free mini-tours of the exhibitions, performances by Codarts circus students, a lecture by Charlotte Lybeer, and an Artist Talk with Kunsthal Light artist Thera Clazing. It was also possible to take part in an SKVR writing workshop inspired by the work of Krištof Kintera, to print a T-shirt à la Parra, and to juggle with guidance from Circus Rotjeknor. There was music by the instant composing duo Stephanie Francke and Friso van Wijk and the young singer/songwriter Tim Verhaal. The public could also sample Freaky Food at all hours in the Kunsthal café. In June the Kunsthal joined in the first edition of the Rotterdam Roof Days, the first opportunity for the public to take to the roof of the Kunsthal, to discover the swarms of bees, and to enjoy the view. 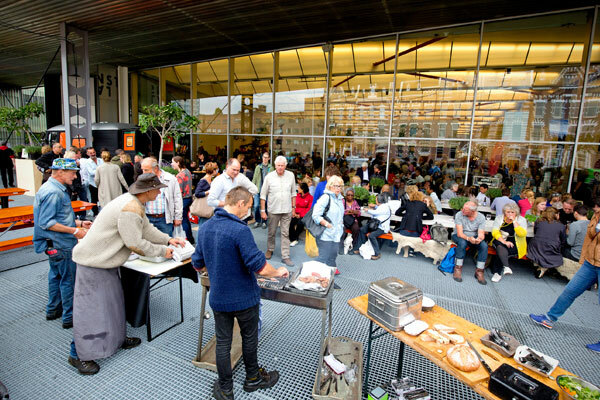 The festival KunsthalCooks & cultivates, coinciding with the Parade, also meant collaborating with a large number of parties in the city of Rotterdam and a bustle of activity in the Museumpark during the summer. More than ninety entrepreneurs offered their wares in the ‘Market Hall’, including Rotterdam coffee, Rotterdam beer and Rotterdam mint, the Wijkkeuken, Uit Je Eigen Stad and many more. 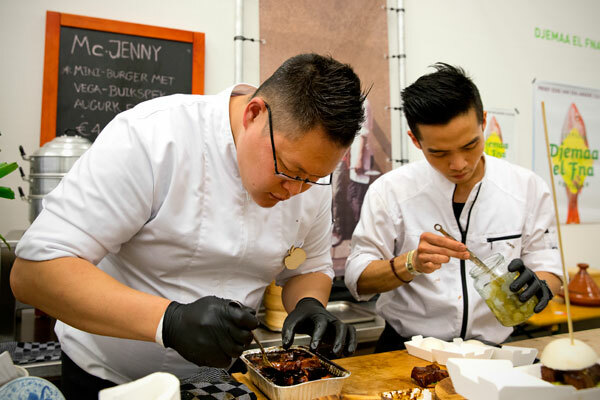 Visitors were introduced to other food festivals from the city, such as Djemaa and fna, and many Rotterdam chefs gave workshops and demonstrations in the Kooktheater. Lectures were given by gardeners, writers and seaweed cutters, while plenty of cooking and sampling was done on the terrace. During the summer exhibition ‘Do it (Kunsthal Rotterdam)’, a lot of beautiful local collaborations took place with artists and collectives and the public could make their hands-on contribution to the works of art in the exhibition throughout the summer. During the Keith Haring Weekend, the link was made between the Eighties and the present, taking the themes from the life and work of Keith Haring as the starting point. Lectures from different angles were given on the Zeitgeist of the Eighties. The Doelen Ensemble performed minimal music from the Eighties and there was Vogue dancing by House of Vineyard. 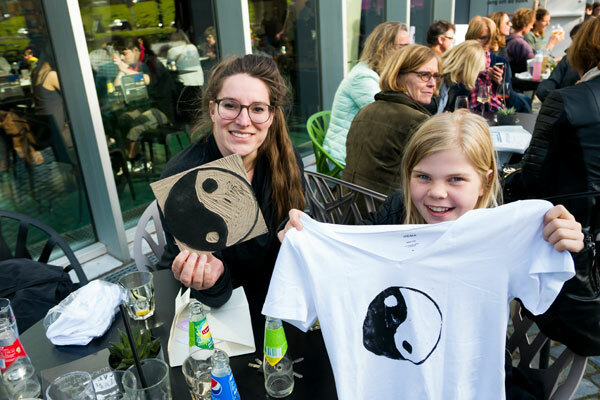 There were also free guided tours by Urban Guides, drawing battles and workshops with street artists Vinze and LuckDubz, a sneak preview by Rewriters 010 and the screening of Christina Clausen’s ‘The Universe of Keith Haring’. Children could make their own protest poster with artists from OPPERCLAES. Young breakdancers from the Hiphophuis gave workshops and demonstrations and DJ Git Hyper from DemonFuzz-Records provided the authentic Eighties sound, while visitors and passers-by worked on the completion of the Community Art Project for the Kunsthal in the Museumpark. The exhibition ‘Keith Haring. The Political Line’ addressed a broad public of all ages and all walks of life. The recognisable, iconic language of symbols and the clear line in the work of Keith Haring could be seen in many of the streets of Rotterdam during the exhibition period. Thanks to the collaboration with RET, the centre of gravity of this Citydressing was on the biggest metro station in Rotterdam – Beurs – and for a good reason: between 1980 and 1985 Keith Haring made thousands of subway drawings, the chalk drawings on black paper on the publicity wall frames of the New York subway that have become world-famous by now. The tumbling, running figures and barking dogs also left a trail through the rest of the city. 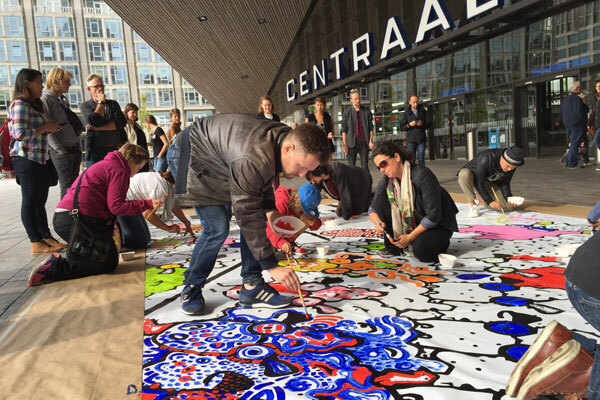 In collaboration with partners such as Inntel Hotel, the entrepreneurs’ association Nieuwe Binnenweg and the Central Station Rotterdam, numerous locations in the city were tagged with the figures of Keith Haring. These images were regularly shared and clicked on the social media. During the opening weekend the Bijenkorf Rotterdam dedicated a wonderful window display to Keith Haring as an eye-catcher for the shoppers. Schmidt Zeevis served herring during the events and decorated all its vehicles in Haring style. The Community Art Project also contributed to enlivening the city: the winning creations of the Keith Haring Art Challenge were painted by an enthusiastic public on a canvas several metres long during 24 uur cultuur in front of the Central Station and during the Keith Haring Weekend in the Museumpark Rotterdam. The success of ‘Keith Haring. The Political Line’ was partly due to the many initiatives and forms of collaboration connected with the exhibition. During a MASH-UP! 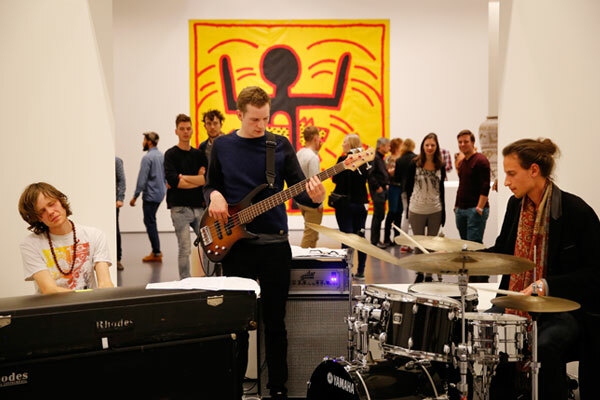 with IFFR and the North Sea Jazz Festival, the followers of three strong cultural brands met one another in the Kunsthal. The Kunsthal and Rotterdam (street) artists took part in the Rotterdam Debate Night and there was a collaboration with the Aids Fund on World Aids Day. 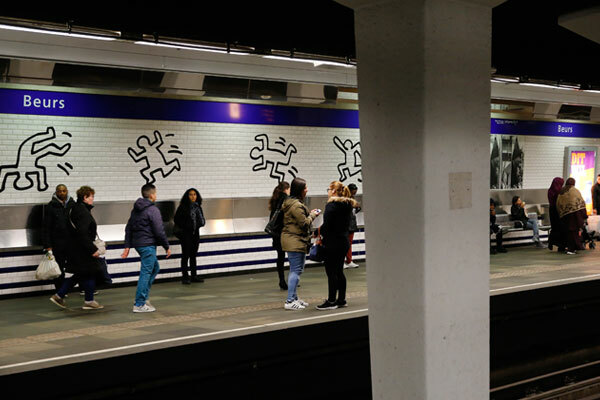 Thanks to Kunsthal ambassador Nationale-Nederlanden, a tribute to Keith Haring by the artist Johan Moorman was exhibited in the busy NN DE Café at Rotterdam Central Station for the entire duration of the Keith Haring exhibition. Various hotels, including Hotel New York, ran special arrangements and many well-known Rotterdam figures, from ex-mayor Opstelten to artists, joined in working on the special Bilder exhibition trailer. See too Events en Nieuw Publiek. 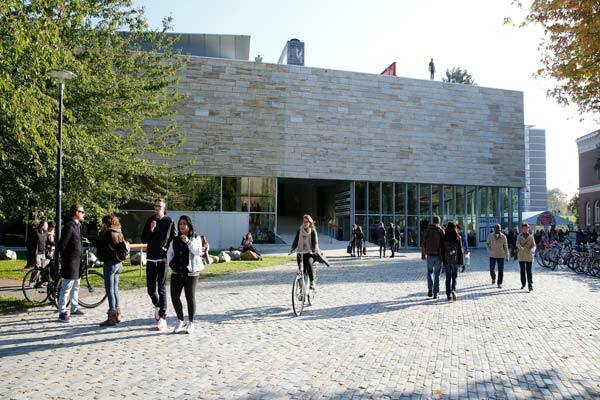 These and other events, such as the presentation of the VSB Poetry Prize, the presentation of the architecture periodical OASE in the presence of Rem Koolhaas in an Auditorium packed to full capacity, as well as the HAL Investments dinner and a wedding in the Auditorium, constantly gave the Kunsthal that extra pulling power. These are only a few examples of how the Kunsthal contributes to enlivening the city and the Museumpark.